Here’s one to arouse your primal instincts. Butoh-inspired choreography and gruesome stage combat will be the hallmarks of The Vagrancy’s upcoming production of Macbeth directed by artistic director Caitlin Hart. The production takes place in a post-apocalyptic Scotland and promises to be an unnerving and eerie fusion of classic and modern futility. 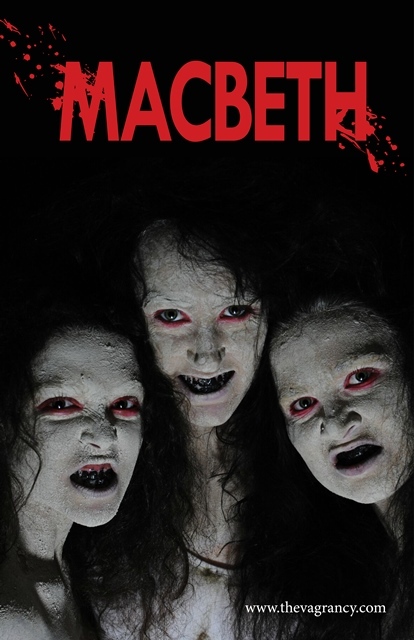 Hart will tell the story of Macbeth’s path of tyranny, murder and madness in an aggressive cut (show runs 100 minutes) which finds the temporary king haunted by the prophecies of three nightmarish witches and bolstered by his ambitious wife. The cast stars Daniel Kaemon as Macbeth and Alana Dietze as Lady Macbeth, with Arthur Keng (Banquo), Joseph Valdez (Macduff), Elitia Daniels (Lady Macduff), My-Ishia Cason-Brown (Ross), Brandon Ruiter (Malcolm), Kamar Elliot (Lennox), Marissa Brennan (First Witch/Hecate), Kelly Perez (Second Witch), Carolyn Deskin (Third Witch), Ann Colby-Stocking (Queen Duncan/First Apparition), Steve Madar (Porter/Doctor), Austin Iredale (Siward/First Murderer), Blaine Nicholls (Captain), Andrew Walke (Angus), Ciera Jo Thompson (Donalbain/ Caithness), Rebecca Everhart (Witch/Messenger), Maia Kazin (Witch/ Gentlewoman), Meredith Brown (Witch/Nurse), Aliyah Conley and Mia Moore doubling as Macduff’s Child, and Andrew Grigorian (Fleance). Dance choreography is by Holly Rothschild and fight choreography is by Jason Vaughn. The creative team also includes Tristan Jeffers (set design), Kaitlyn Kaufman (costume design), Matt Richter (lighting & sound design), Gabriela Zarate (props design), Steve Madar (technical director), Amanda A. Padró (dramaturg), Kathryn Read Fisher (associate producing director), Karina Faulstich (assistant director), Miranda Stewart and Jamie Hannah Drutman (co-producers), Kelly Egan (stage manager) and Karina Wolfe (public relations). The Vagrancy is an LA-based theatre company that creates visceral work in order to touch the human spirit. For more about the company go to www.thevagrancy.com.